Community partnerships help StepUp to broaden our base and serve persons in additional outlets. 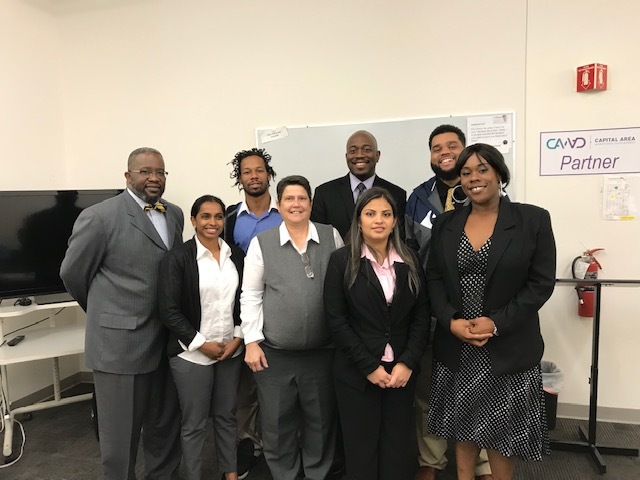 The Employment program has “spread our wings” over the course of the past year and held workshop weeks at the Salvation Army, the Wake County Human Services complex, in Wake Forest, and at Dorcas Ministries in Cary, NC. We are excited to increase the footprint of the program and look to explore additional resource partnerships and locations as we enter the new calendar year. Contact the Employment Team Lead, Dennis A. Jarmon, for more information about how your organization/you can help! This photo is from the StepUp Employment Week Workshop held at Dorcas Ministries in November. This past Thursday, we had another great field trip with our children’s team! We had almost twenty kids currently in the program and from Alumni join us for an all-day outing to Durham. We started our day by visiting the Diaper Bank of North Carolina. There, we got to see how the diapers that are donated to our families are packaged, sorted, and delivered. We even got to join in and help out with packaging boxes and boxes of diapers. It was all hands on deck, and everyone joined in with a little competition to see who could get through their stack the fastest! We can’t thank the Diaper Bank enough for showing us how the warehouse works, and for letting our kids jump in and help. We appreciate all that you do for us, and are so thankful for the support you give our families through diapers and wipes. We refueled our energy with lunch, and headed for our afternoon at Hope Reins. Hope Reins is a wonderful equine facility that serves children and families in Wake County and surrounding areas that need support and comfort during difficult times. They have partnered with StepUp for over 5 years now to host us for an afternoon of fun each summer. The kids got to learn about the horses, go fishing, play games, and enjoy snow cones. Thank you, Hope Reins, for having us. We had a lot of happy but tired kids at the end of the day! DHIC says, "A Home is a Catalyst"
At StepUp, we depend on our community partners, because we know that we can’t do it all on our own. One of StepUp’s oldest community partners is the Downtown Housing Improvement Corporation (DHIC). Katrina Lyons, a participant turned co-partner turned board member, sits in front of her very first apartment, which she was able to get with the help of DHIC. She is now a home owner! We know that stable housing is key to the success of our Life Skills participants. Even as they are working in their job, learning how to budget, and making smart financial decisions, our participants are still left looking for stable, safe, affordable housing. Some individuals, like James Ivy, are ready for prepare for home ownership, while others may prefer to rent. James said, “I feel so blessed that my wife and I are now well informed and able to purchase a home. We will finally have a place to call home…it’s ours.” Our partnership with DHIC allows them to do whichever is best for their personal needs. Love pie? Sell pie and help a neighbor. Share the Pie, a joint fundraiser with Alliance Medical Ministry, aims to create stable families through access to employment and healthcare. We are back this year, and we need people to sell pie. Would you like to get involved in this mission? It's simple. We will just ask you to sell 20 pies to your friends, coworkers, etc. You will be eligible for incentives along the way, and most of all, you will be joining in our mission of creating stable families this Thanksgiving. Please contact Lydia Pickard (lpickard@stepupministry.org or 919-781-0156 ext. 122) if you are interested! In its beginning stages, StepUp Ministry worked to assist homeless individuals in obtaining housing. Eventually, the organization grew to include an employment program and life skills training. This was done to give a safe space for people to change more than just a difficult situation, they could change their entire life. Community means different things to different people. But the underlying message is working together with the common goal of everyone growing, rising and thriving together. The Jobs Team at StepUp Ministry has been fortunate in partnering with different agencies in the community to provide job training to the unemployed residents of Wake County. The Salvation Army is one of those agencies, and we have been fortunate to work alongside them over the years. This month they hosted the Employment Week Workshop at their facility located near downtown Raleigh. We are grateful for their partnership and support! Rachael Ray Supports StepUp--Will You? The Rachael Ray Show gave us a big surprise last week, sending us two huge boxes full of interview clothes for our men and women in employment week! Check out the video here. Do you have any clothes to donate? 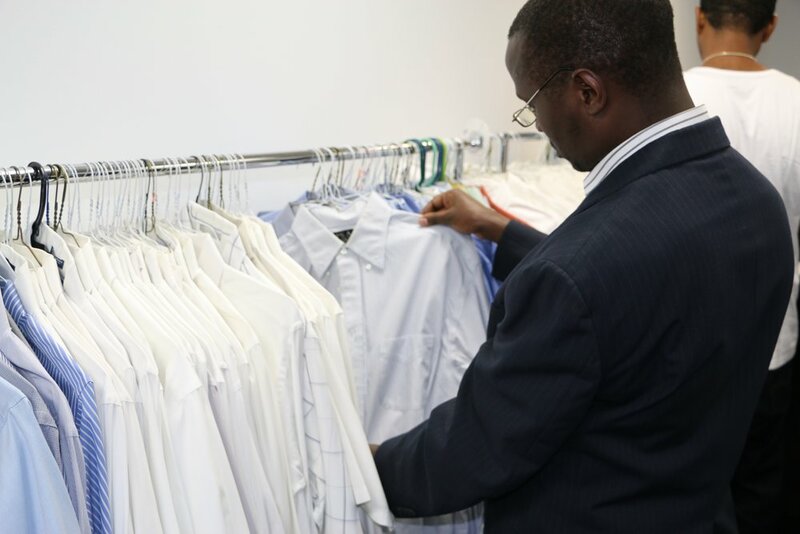 GG's Closet accepts ONLY men's business attire including suits, blazers, dress pants, shirts, dress shoes, ties and belts. We are especially in need of sizes 38-39, and sizes 50 and over. To donate, please bring all clothing on hangers to the StepUp Ministry Office. StepUp Ministry Advocate and former StepUp Board Chair Ashley Huffstetler Campbell is impacting lives in the Triangle. Today, she helps open the doors of the Campbell Law Clinic. Eight Campbell law students, overseen by the clinic’s director, will work in the clinic, which will take referrals from area nonprofit agencies – Raleigh Rescue Mission, Urban Ministries of Wake County and StepUp Ministry. Thank you Ashley and the Campbell Law Clinic for your dedication.